Even if you are not a pet lover, you will like this movie! This movie is adorable because the Alpha pack competes against all different animals to win bragging rights for their territory. Stinky, Claudette and Runt learn about teamwork and let me tell you- it is adorable! This DVD includes special features such as the Great Games Amazing Maze and a Wolf Awareness Trivia Game! Check out the adorable trailer below! This movie is fun for the entire family! I love how the characters are adorably animated! Check out this adorable activity sheet for the movie here! You can also check out this recipe to make puppy chow ( for people of course) for the entire family to enjoy eating while they watch! 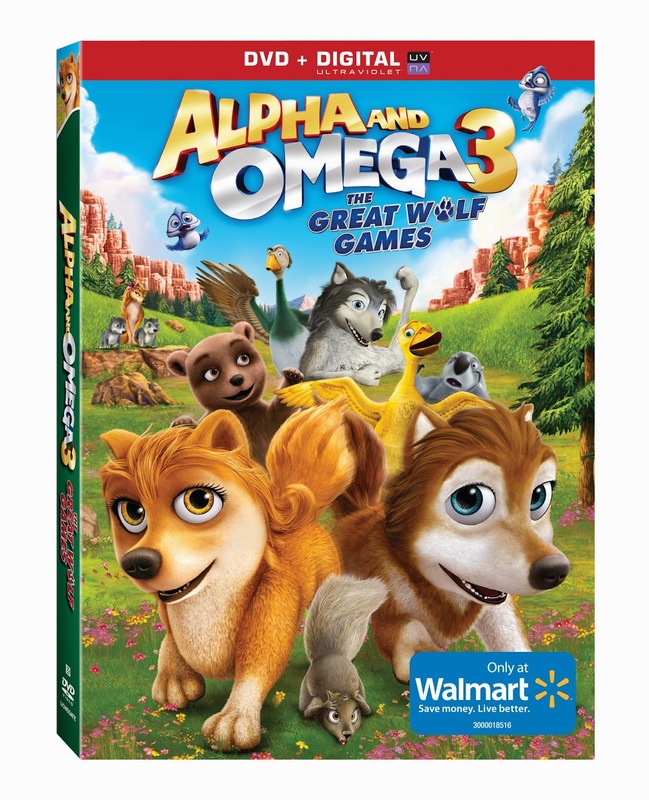 Alpha And Omega 3: The Great Wolf Games is available at Walmart now! Blu-ray SRP: $24.99 & DVD SRP: $19.98 Visit Lionsgate on their website for other DVD releases and their social media below to stay up to date with the latest! 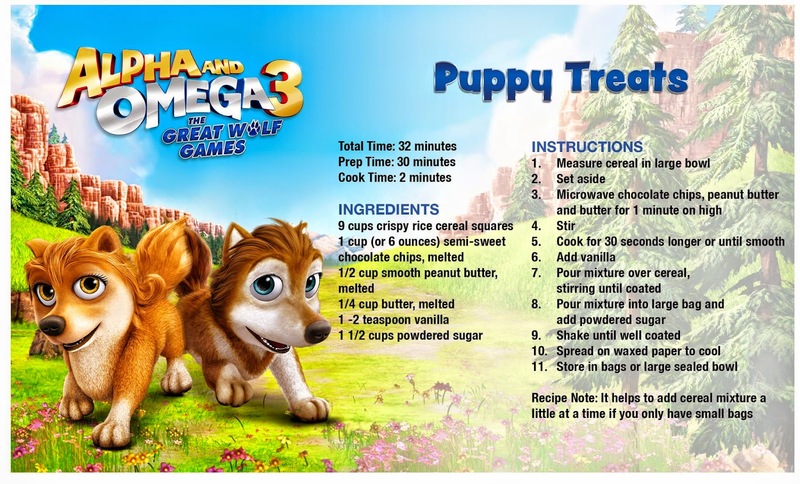 WIN IT: One lucky reader is going to win a Alpha And Omega 3: The Great Wolf Games DVD copy of their own! This giveaway will run until 4/17/14 and is open to the Continental USA. No purchase necessary to enter. Please remember the winner will have 24 hours to respond to their winning email. Must complete ALL mandatory entries to qualify. There are extra daily entry events to score you more chances to win! Don't forget the refer friends feature on the form so you can get 20 extra entries!! Enter with the giveaway tools below and good luck! I think you have great giveaways. But visa and department store gift cards are always nice. I would like to see more gift card giveaways, like starbucks, or more organic product tailored for women, like cloth pads, organic tampons, organic skincare, makeup. I like Movies or TV Shows! What items would I like to see in your giveaways? All things for babies and children. Playpens, high chairs, carseats, all things educational. I like books or board games, as well! Toys, books and gift cards! Giftcards would be a great prize to give away! I would love to see anything to do with travel as part of a give away. Anything for little boys! I have a new nephew to spoil! I would be interested in anything for the summer! Any kind of sports, roller blades, basketball, baseball, etc. Any giveaways for shoes would be great! I just bought the Sketcher Go Walks and LOVE them! I would really like a giveaway for earrings, necklaces, or rings! TV Series on DVD would be a great giveaway! Restaurant gift cards would be a great giveaway! I would really enjoy tickets to a concert. little girl things and cartoons would be AWESOME FOR GIVEAWAYS!